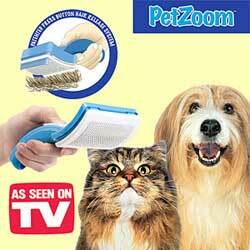 Pet Zoom brush is the self-cleaning, one-touch way to groom your pet. Easily remove unwanted hair, dander, dirt and debris from your dog or cat’s fur - push button to release from brush! Soft, ultra-comfort bristles adjust for long or short coats. Use for wet or dry grooming. 7 1/4 x 4 3/4 x 2 1/4"